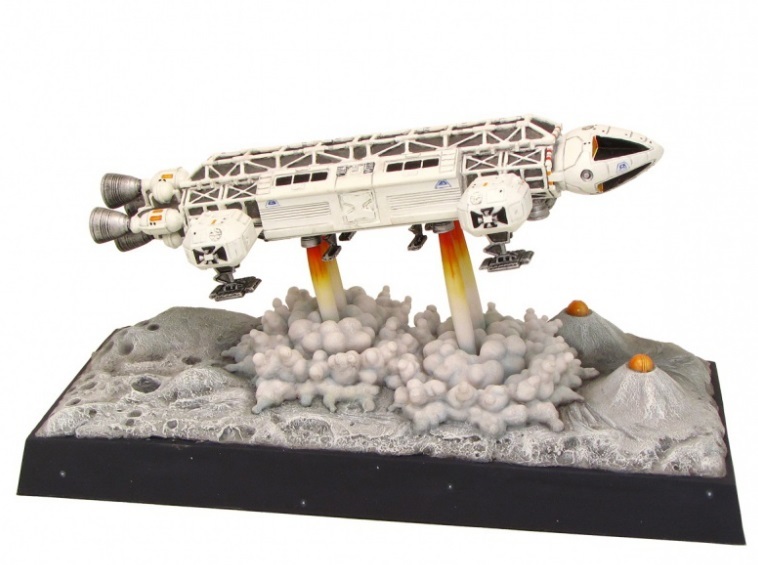 Robert Harrop’s latest Limited Edition is the Eagle Transporter from TV’s Space 1999. The series was produced by Gerry and Sylvia Anderson and origianally ran from 1975-1977. The model is another excellent recreation from the Robert Harrop team. It is priced at £100 and is Limited to 250 models. The Eagle Transporters are the primary spacecraft of Moonbase Alpha, the Earth’s primary space research centre and monitoring station for the Earth’s nuclear waste disposal. The Earth’s atomic waste has accumulated to such an extent that it has become a major environmental problem. Nuclear Disposal Area One (NDA 1) was established on the far side of the Moon and was used until the construction of the more advanced NDA 2. Launched from five landing pads located around the base, the Eagles are powered by four nuclear fusion rockets that carry enough fuel reserves for up to 48 hours of flight. Using its chemically-fuelled landing rockets, the Eagle’s also have the capability to navigate, land and take off in the atmosphere of a planet with normal-gravity. Designed for transport, reconnaissance and scientific survey, the Eagles are therefore a true utility vehicle. Totally modular, each spacecraft is divided into three basic sections: the command module, the centre module, and the superstructure. The centre module can be replaced depending upon the scenario and mission at hand, to utilise such modules as passenger, reconnaissance, laboratory and rescue pods. Although the Eagles are not designed for military use, some have been fitted with a laser emitter and an arsenal of space-to-space missiles. In addition to the primary weapons, a retractable laser gun, for use when the craft is grounded, can also be fitted to the ‘backbone’ of the ship.